HOUSTON, TEXAS (October 16, 2014) For the fifth year, the Texas Flying Legends Museum (TFLM) announces that it will participate in the 30th Annual Commemorative AirForce (CAF) Wings Over Houston Airshow on November 1 - 2, 2014. Ellington Field gates will open at 8:00 am with the flying scheduled to begin around 10:00 am. Tickets are required and can be purchased at www.WingsOverHouston.com or at the gate, closing at 6:00pm. TFLM maintains a collection of pristine warbirds including an A6-M2 Japanese Zero, B-25J Mitchell Bomber, two P-51D Mustangs, P-40 Warhawk, and F4U Corsair. The “Flying Legends” will participate in aerial performances and are on display on the Warbird Ramp (open for up-close views from 8:00am - 11:30am during the show). Warbird pilots of yesterday and today will offer commentary on their relationship with these planes. In the late 1930s America’s first black military pilots stepped up to serve their country and the “Tuskegee Experiment” trained them and their support crews; they became heroes. Strength, courage, and ability to triumph over adversity during WWII can serve to inspire others about how to succeed today. The CAF Red Tail Squadron will travel to this year’s airshow with their P-51C Red-Tail Mustang and the RISE ABOVE Traveling Exhibit, a movie dedicated to sharing the legacy of the Tuskegee Airmen. RISE ABOVE admission is always free and the movie will be playing continuously throughout the airshow. This program is geared to youth but will be of interest to all ages. Students, youth organizations and special interests groups are invited to contact TFLM for requests to preview RISE ABOVE, their P-51C, and TFLM Warbirds October 28 - 30, 2014. Visitors may also meet Col Charles McGee and Lt Col George Hardy, original Tuskegee Airmen who are scheduled to make appearances. The TFLM mission is simple: honor the past generations and inspire the leaders of tomorrow. Considered a traveling museum, partnering with the Dakota Territory Air Museum, the focus is on bringing “Flying Legends” to small airports around the country, that form the hubs of many Veteran-based communities. Aviation enthusiasts and experts from around the world visit the Texas Flying Legends Museum during each year’s airshow. As we witness the passing of the “Greatest Generation,” and honor all servicemen, Texas Flying Legends Museum sees beyond the entertainment that airshows provide. By facilitating discussion and open learning, airshows can become a kind of classroom where families and especially younger generations can learn about history and experience the glory of aviation. MESA, ARIZONA (October 26, 2014) The championship game of the 2014 Rock-tober PCA 12 and Under USA Water Polo Classic left no doubt as to who was “Number 1” at Kino Aquatic Center in Mesa, AZ on Sunday October 26, 2014. The San Diego Shores team, led by coaches Charlie Equels and Nicole Maichrowicz, won 8-4 against Long Beach Shore Aquatics Red, coached by Chase Mccoll, to finish the tournament undefeated. San Diego Shores finished the tournament with an impressive 52 goals while only allowing their competition to score 18 goals. 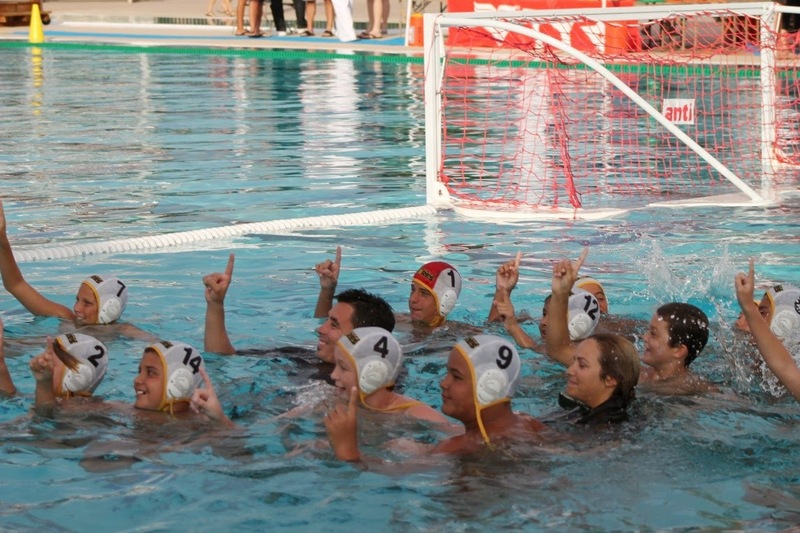 The second place team, Long Beach Shore Aquatics Red, only lost two games over the weekend, both against SD Shores. In the first loss of 7-7 (4-3), the game ended in a sudden death shoot-out after four hard fought periods with the lead changing often. Third place was awarded to Mid Valley Water Polo, coached by Davit Gharagyozyan after winning 9-6 against Vanguard Blue, coached by Nemanja Jokanovic. Other teams that participated in the first annual “Rock-tober” tournament hosted by Mesa Water Polo Club included LA Premier, Greenwich, SOCAL Boys, Commerce, Pacific Polo, Chelsea Piers, Colorado, SOCAL Girls, Viper Pigeons, Mesa Water Polo “A”, Mesa Water Polo “B”, and Albuquerque. As a special treat, the trophy ceremony included water polo Olympian and USA Water Polo Hall of Fame member Craig Wilson, who passed out the medals and shook the hand of each young player and their coaches. 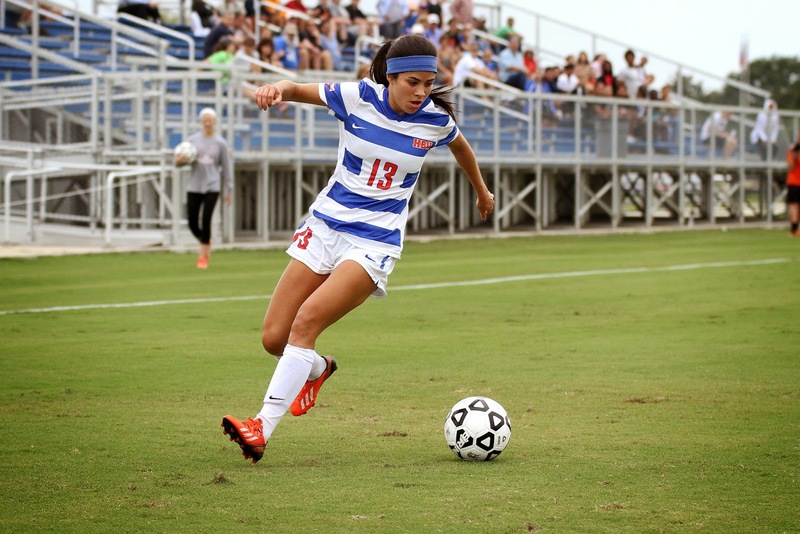 CORPUS CHRISTI, TEXAS (October 26, 2014) Junior midfielder Rebekah Tovar broke a 1-1 tie with a goal in the 71st minute, as HBU earned a trip to the Southland Conference Tournament with a 2-1 victory over Texas A&M-Corpus Christi Sunday afternoon. HBU punches its first trip to the conference tournament, as the Huskies won their fifth-straight match. The last time HBU won five straight was in 2011, when the Huskies went 11-9-1 and 4-1-1 in their final season in the Great West Conference. Tovar and Natalie Hager scored for HBU (7-6-3 overall, 6-1-2 SLC), while Blake Martin and Ellee Hall registered assists. Tovar and Hager each took three shots, while Tovar had two shots on goal. Walrath stopped three shots and allowed the one goal as she improved to 6-5-2 on the season with a 0.98 goals-against average. Yvette Franco scored for TAMUCC (4-7-3 overall, 3-5-1 SLC), as she and Aulona Velaj each led the Islanders with three shots. Megan Delaney made two saves and allowed two goals in net for the Islanders. HBU took a 1-0 lead in the 19th minute, as Martin fed Hager and she beat Delaney one-on-one. The Islanders tied the match with just 40 seconds remaining in the first half, as Bri Lugo passed the ball to Franco, who beat Walrath at an odd angle. The goal snapped the Huskies’ shutout streak at 355:56, dating back to a second-half goal by McNeese State Oct. 5. TAMUCC outshot HBU, 6-2, in the first half. Neither team took a corner kick. HBU weathered five Islander corner kicks before the Huskies took a 2-1 lead in the 71st minute, as Tovar beat Delaney on a one-timer off a pass from Hall. The Islanders put pressure in the waning minutes, as Becca Chance’s shot went right and the Huskies’ defense blocked Franco’s shot at the 87:35-mark, but HBU held on for the win. HBU outshot the Islanders, 10-4, in the second half and 12-10 for the match. Corner kicks were 5-2 in favor of TAMUCC. HBU plays at Sam Houston State Friday, Oct. 31 at 6:30 pm before hosting Southeastern Louisiana on “Senior Day” Sunday, Nov. 2 at 1 pm. HOUSTON, TEXAS (October 25, 2014) The Houston Baptist Huskies scored two touchdowns and two extra points in the fourth quarter, coming back from a four point deficit, to down the Nicholls Colonels by the score of 31-21 at Dunham Field in Houston on Saturday, October 25, 2014. The vicrory marks the Huskies' first ever win against a Southland Conference opponent and raised their season record to 2-6. Nicholls wasted no time getting on the scoreboard, driving 75 yards in 11 plays, resulting in a five yard run by running back Michael Henry. The three minute, 25 second drive was capped off with a Conner Fryouz extra point to give the Colonels a 7-0 lead. HBU responded a bit over eight minutes later when running back Larry Day carried the ball the final yard of a 60 yard drive for the touchdown. Travis Shinn booted the ball through the uprights for the conversion to even the score at seven. After short stints of possession by both teams, the Huskies began a drive with 22 seconds remaining in the first quarter which lasted 7:46. They drove ball 83 yards in 17 plays for their second touchdown of the game; a five yard pass from quarterback Jonathan Fleming to wide receiver D’Angelo Wallace. Shinn added another point to his season total for the extra point; making the score 14-0. The right-footed kicker from Rockwell, Texas added another field goal to his season total with no time remaining on the clock to give HBU a 17-7 lead going into the locker room at halftime. After what must have been an inspirational talk in both locker rooms, the Colonels came out of the locker room like a vengeance. Nicholls scored two unanswered touchdowns in the third quarter to take the score to 21-17 in favor of the Colonels. Quarterback Beaux Hebert connected on a monstrous 60-yard pass to Demon Bolt for one touchdown at the 8:49 mark. Michael Henry rushed for the second touchdown with 38 second remaining in the quarter. Trailing by four points with 15 minutes remaining in the games, the Huskies buckled down scored twice in the fourth quarter to secure the win. With 12:41 remaining in the game. B.J. Kelly carried the ball the final 29 yards on an 85 yard drive to score his first touchdown of the game. Kenneth Bibbins added his own touchdown at 7:07 woth a 24 yard pass from Fleming to cap odd a 62 yard, eight play drive. Kelly carried he ball 29 yards for 153 yards, averaging 5.3 yards per carry. Bibbins caught two passes for 57 yards and one score. Fleming threw for two touchdowns; completing 10 of 20 passes for 127 yards. 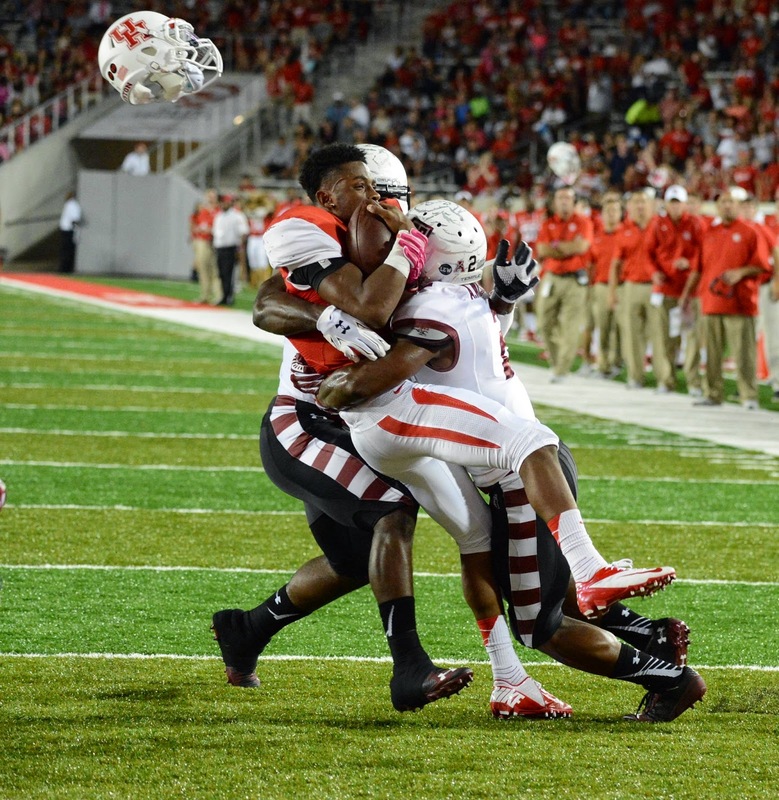 The Huskies will next face the Lamar Cardinals on Saturday, November 1, 2014 in Beaumont, Texas. Kickoff is scheduled for 6 p.m. CT.
HOUSTON, TEXAS (October 25, 2014) With the score seesawing back and forth all afternoon, the Texas Southern Tigers could not contain Arkansas-Pine Bluff final drive and fell to the Golden Eagles by the score of 38-37 in front of 8,210 fans at BBVA Compass Stadium in Houston, Texas on Saturday, October 25, 2014. In the first quarter, Texas Southern and Arkansas-Pine Bluff each scored a touchdown and a field goal to end the quarter in a 10-all tie. The loss dropped the Tigers to 5-3 for the season and 3-3 in the Southwestern Athletic Conference. Pine Bluff raised their conference record to 1-4 and 2-5 for the season. The Golden Lions scored at the 6:31 mark with a 26-yard field goal by Tyler Strickland. He also scored the extra point after Benjamin Anderson connected with C.J. Branch on 34-yard pass with 4:41 remaining in the quarter. The Tigers tallied their points on a 41-yard touchdown pass from Homer Causey to Daveonn Porter and Eric Medina’s extra point. Medina added a 42-yard field goal with 42 second left in the quarter. Pine Bluff put the pedal to the medal in the second quarter, scoring 16 points to make the score 26-17 at halftime. Walk on running back Brian Hanley scored two touchdowns, on runs of 17 and 23 to give the Golden Lions 12 points. Strickland connected on one of the extra points, missing one and added a field goal to close out second quarter scoring. TSU added seven points with 17-yard pass from Causey to Malik Cross and a Medina extra point at the 8:12 mark in the third quarter and an additional seven points with 4:25 left in the quarter. That closed out the scoring, giving TSU a 31-26 lead with 15 minutes to go. Pine Bluff regained the lead with a Willie Young 60 yard pass reception, making the score 32-31. Texas Southern responded with their own aerial touchdown when Causey hit Larry Clark from 16 yard out for the score and the lead with 2:31 left in the game. After the ensuing kickoff, Anderson unleased a monstrous pass on the second play from scrimmage, again connecting with Young. He grabbed the ball on the 69-yard pass play and the final score of the game. Porter carried the ball 18 times for 187 yards and one touchdown while Causey completed 27 of 35 passes for 333 yards and three touchdowns. Anderson completed 12 of 23 passes for 288 yards and three touchdowns. Porter caught seven passes for 83 yards and one TD, while Clark added 78 yards on the ground with five carries. Next on tab for TSU will be Grambling State on November 1, 2014 with a 5:30 p.m. kickoff at BBVA Compass Stadium. The Tigers are 5-3 for the season and 4-0 in SWAC action with their most recent win a 63-39 victory over the Golden Eagles on October 18, 2014.
long delay due to the power outage. HOUSTON, TEXAS (October 18, 2014) Falling behind 31-13 at halftime, the Houston Baptist UniversityHuskies could not overcome the deficit and fell to the Stephen F Austin Lumberjacks by the score of 59-27 at Dunham Field in Houston on Saturday, October 18, 2014. The Lumberjacks quickly got on the scoreboard in 20 seconds at the beginning of the game. Braxton Beardon returned the HBU kickoff 65 yards to the Huskies two-yard line. Running back Gus Johnson carried the ball the final two yards for the score. With the Jordan Wiggs kick splitting the uprights, SFA took a 7-0 lead. After the kickoff by the Lumberjacks, Huskie quarterback Jonathan Fleming completed a 13 yard pass to wide receiver Ethan Fry for a first down. Then the players, coaches, fans, and media had to wait one hour, 55 minutes for the next play. As the play was under review, suddenly, the lights when out at Dunham Field and darkness covered field and stands. The only lights illuminating in the stadium complex were under the stands, in the press box and the concession stands at both ends of the bleachers. Center Point Energy was notified and after nearly one and a half hour of darkness, lights were restored and both teams were given approximately 20 minutes of warmup. After the restart, SFA rattles off 78 yards in three plays concluding with a 36-yard pass from quarterback Zack Conque to wide receiver Aaron Thomas for another six points. Wiggs again concerted the extra point to give the Lumberjacks a 14-0 lead at the 11:33 mark in the 1st quarter. The Huskies responded less than two minutes later with a Craig Bell 34-yard run to get the Huskies on the board. Kicker Travis Shinn missed the extra point to cut the SFA lead to 14-6. The Lumberjacks added Conque quarterback keeper eight-yard touchdown run, another Wiggs extra point for seven more points. Wiggs added three points with a 33-yard field goal to close out the first quarter scoring. SFA and HBU traded touchdowns in the second quarter with the Lumberjacks scoring on a 15-yard Gus Johnson run and another Wiggs extra point. The Huskies closed out the half with a one-yard run by Bell for his second touchdown of the night. Shinn added the extra point to close the half out with SFA leading 31-13. 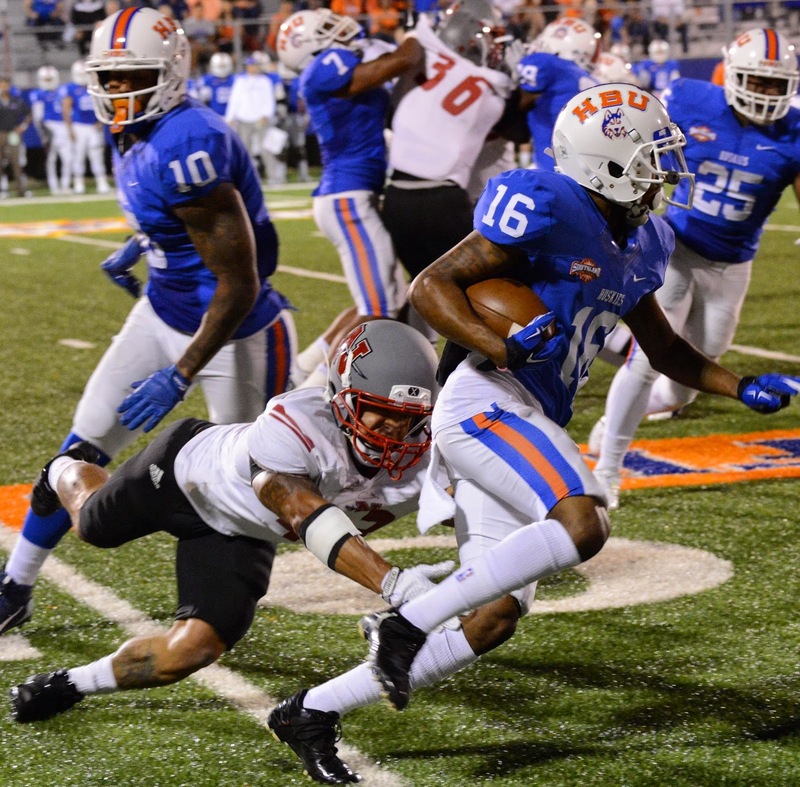 They again traded touchdowns in the third quarter with HBU scoring on a seven-yard pass from Jonathan Fleming to D’Angelo Wallace and a Shinn kick. The ‘Jacks added seven more points on a 17-yard run by Gus Johnson and a Wiggs extra point to make the score 38-20 with 15 minutes to play. With 13:57 remaining in the game, SFA padded to their lead with a seven-yard reception by Justice Liggins for the touchdown and another extra point by Wiggs. The ‘Jacks added three insurance touchdowns and extra points in the fourth quarter to close out the scoring at 59-27. With the win, the 'Jacks raise their season record to 5-2 and their Southland Conference record to 2-1. The Huskies fall to 1-6 and 0-4 in conference play. result of a vicious hit during the Cougar's 31-10 win over Temple. HOUSTON, TEXAS (October 18, 2014) The Houston Cougars upped their season record to 4-3 for the season and 2-1 in conference play with a 31-10 win over the Temple Owls at TDECU Stadium in Houston on Friday evening, October 18, 2014. The much needed win put them over .500 for the first time this season and extended their hopes for a high finish in the conference and a possible bowl bid. The Cougars wasted no time getting on the scoreboard, when they scored their first 10 points within eight seconds of each other. After driving 61 yards in 15 plays, Houston had to settle for a field goal by Kyle Bullard. The sure-footed kicker from Boerne, Texas split the uprights from 34 yard to give the Cougars a 3-0 lead at the 7:12 mark in the first quarter. After the ensuing kickoff, Temple quarterback P.J. Walker threw on first and ten, with the pass being immediately picked off by free safety Trevon Stewart. He returned the ball 29 yards for the pick-six touchdown. Bullard followed up with the extra point to give Houston a 10-0 lead; with the field goal, touchdown and extra point scored in a mere eight seconds. Temple answer with no time remaining in the quarter with a 22-yard field goal by Austin Jones. The Cougars took possession of the ball after the Owl field goal at the beginning of the second quarter. Quarterback Greg Ward Jr. started a nine play, 63 yard drive that resulted in running back Kenneth Farrow rushing the final four yards for the touchdown. Bullard again split the uprights to give Houston a 17-3 lead with 11:30 left to play in the first half. Farrow’s touchdown run gave him back-to-back games with a rushing touchdown for the third time in his college playing career. The back-to-back touchdown game in 2013 for his first for the current season. The Owls got the ball with 3:04 left in the half; driving 76 yards in plays with Walker connecting with wide receiver Keith Kirkwood for a 39-yard pass reception and the six points. Jones added the extra point to cut the Cougars’ lead over the Owls to seven points. In the third quarter, Walker hit Jahad Thomas with a screen pass, which promptly allow Thomas to scramble 74 yards down to the Houston one-yard line. Walker then attempted to carry the ball into the end zone on a first-and ten play. He has hit at the goal line and fumbled the ball, which was recovered by linebacker Steve Taylor inside the end zone. The play was ruled a touchback and Houston took over on their own 20-yard line. Ward Jr. began another one of his patented drive which stalled, forcing the Cougars to punt. After a seven play, 34 yard drive by Temple, Houston got the ball back and began a 34 yard drive that concluded with another Ward Jr. to Greenberry pass for a seven yard reception and another touchdown. Bullard again did his job and kicked the extra point for the Cougars; allowing them to increase their lead to 24-10. Temple got the ball back with 1:42 left in the third quarter when Walker again could not connect with his receiver, allowing Houston to pickoff another pass. The Cougars drove the final 26 yards when Ward Jr. passed to running back Ryan Jackson for another Houston score. With Bullard booting his fourth extra point of the game, Houston led going into the fourth quarter by the score of 31-10. The fourth quarter saw little action, with no scoring and with Houston having control pf the ball in the final minutes of the game, they just road out th clock for their fourth win of the season. Ward, Jr. was virtually unstoppable: completing 29-of-33 passes for 268 yards and two touchdowns. He also carried the ball 13 times for 44 net yards. Greenberry caught 10 passes for 63 yards and one touchdown while Markeith Ambles caught six passes for 96 yards. Farrow carried the ball 28 times for 56 yards and one touchdown. Defensively, Steven Taylor had seven tackles and with Efrem Oliphant accounting for six. With the win, Houston raises its series record with the Owls to 4-0. The Cougars now have next weekend off as they prepare to face USF on the road on November 1. They will return to TDECU Stadium on November 8 to play Tulane in the Cougars’ annual homecoming game. Senior Natalie Hager scored two goals for Huskies. 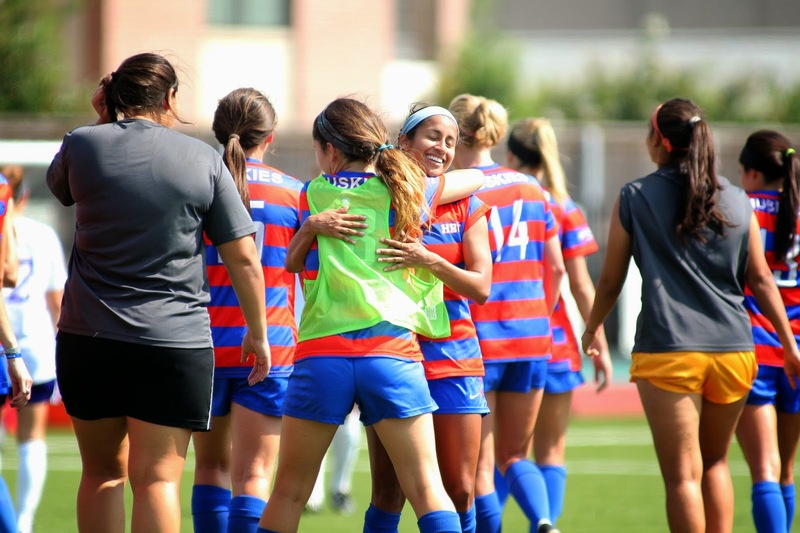 HOUSTON, TEXAS (October 13, 2014) – The HBU women’s soccer team ended their four-match home stand with a bang, as the Huskies shut out visiting Incarnate Word, 5-0, in a Southland Conference match Sunday afternoon at Sorrels Field. The match was delayed 1:40 early in the second half due to rain and lightning. Natalie Hager scored two goals to lead HBU (4-6-3 overall, 3-1-2 SLC). It was her first multi-goal match since she scored twice in a 3-1 win at Northwestern State on Sept. 7, 2012. Connor Ryder and Morgan Dean also scored goals Sunday. Ryder took a match-high five shots and three shots on goal. The five goals were the most scored in a game since the Huskies defeated Prairie View A&M, 5-1, on Oct. 1, 2012. Patty Walrath made three saves in the first 45 minutes as she earned the win, while Katie Turner also made three saves in the second half. Jazma Latu led UIW (1-11-1 overall, 1-4-1 SLC) with three shots, while six different Cardinals had a shot on goal. Heather Kowalik took the loss in goal, as she made four saves and allowed four goals in 45 minutes. Karly Brightwell made three saves and allowed a goal in the second half. HBU scored the first two goals of the match three minutes apart. Ryder scored the eventual game winner in the 17th minute, as Blake Martin passed to Taylor Gibson, who sent a cross pass into the box to Ryder. In the 20th minute, Kristi O’Brien took a throw-in, which went to Rebekah Tovar. Tovar passed the ball to Hager, who scored the first of two goals for the senior. Hager scored her second goal in the 26th minute, assisted by Ellee Hall. With the Huskies putting pressure on the Cardinals deep in their zone, HBU forced a turnover. Hall passed the ball to Hager in the middle of the box, who scored top-shelf. The Huskies’ fourth goal of the first half came with just three seconds left before halftime, as Kelsey Missimer was on the left side and sent a cross pass. Dean made a beautiful header and scored past Kowalik. HBU outshot UIW in the first half, 15-8, while shots on goal were 8-3. HBU took all three corner kick attempts. The two teams played seven minutes of the second half before torrential rain and lightning caused a delay. The delay lasted an hour and 40 minutes before the two teams resumed play on very wet and soggy conditions. Rain continued to fall off and on throughout the remainder of the match. The Huskies’ final goal of the match came in the 87th minute on an own goal. Tovar sent in a cross pass, but a UIW defender attempted to clear, but instead knocked the ball into her own net. Shots were even at 8-apiece in the second half, while HBU held a 4-1 advantage in corner kicks in the half and 7-1 in the match. HBU begins a four-match road trip beginning next Sunday, October 19 at Central Arkansas at 1 p.m.
during their Sunday match against D.C. United. HOUSTON, TEXAS (October 12, 2014) After a one hour, 12 minute weather delay, the Houston Dynamo and D. C. United came back on the field and continued their game which saw United score three goals to drop the Dynamo by the score of 3-1 on Sunday, October 12, 2014 at BBVA Compass Stadium in Houston. The Dynamo came into the game sitting four points out of the fifth place and the final playoff spot in the Eastern Conference. With the loss, the Dynamo were eliminated from the post-season; the first time since 2010 and the second time in club history. After a good start, game was sent into the weather delay in the 22nd minute when officials made the decision to clear the field and the stands due to hazardous weather moving through downtown Houston. After the 72 minute delay, which saw heavy rain, thunder, and lightning, both teams returned to the field, for a 15-minute warmup before the restart. D.C. United got on the scoreboard on the 41st minute when defender Taylor Kemp knocked the ball past Dynamo goalkeeper Tyler Deric. They added their second goal of the day when forward Fabian Espindola raised half the field, eluding Dynamo defenders to sail the ball into the net for an uncontested goal. Houston got their goal in the 83rd minute on a penalty kick by Giles Barnes. D.C United came right back four minutes later with a goal by Eddie Johnson. The Dynamo have two games remaining, against New England on Thursday, October 16 and against Chicago on Friday, October 24. Redshirt freshman running back B.J. Kelly's 64 yards rushing and a touchdown, along with redshirt freshman quarterback Ka’Darius Baker's 63 yards passing contributed to most of the Huskies’ 217 totals yards. The Huskies defense was unable to stop the Cardinals who picked up 27 first downs and a total of 357 yards. The highlight of the Huskies offense was a 52 yard pass from Baker to sophomore tight end Maxwell Brown in the first possession of the game. The drive would later die when a fumble gave the Cardinals the ball at their 24 yard line. The Huskies will be traveling to Conway, Arkansas on Saturday, October 11, 2014 at 6 p.m. to take on Central Arkansas. HOUSTON, TEXAS (October 4, 2014) The Texas Southern Tigers raised their 2014 season record to 5-1 with a 20-16, come-from-behind win over the Mississippi Valley State Delta Devils at BBVA Compass Stadium in Houston on Saturday, October 4, 2014. With the win, the Tigers raised their conference record to 3-1 with five games remaining in the season. Texas Southern got on the scoreboard at the 9:27 mark in the first quarter as the result of an 11 plays, 71 yard drive when kicker Eric Medina split the uprights from 28 yards out to give the Tigers a 3-0 lead. The Delta Devils responded with 1:59 remaining in the first quarter when running back DeShawn Davis scampered 16 yards for six points. Cherchen Galon did his job and booted the extra point, to put Mississippi Valley State up by four, 7-3. The Tigers came back four minutes into the second quarter when free safety Le’Tevi Wilcox alertly picked up a Delta Devil fumble and rambled 40-yard for the touchdown. Medina added one point to his scoring total, and the extra point for the Tigers, to give them back the lead, by the score of 10-7 at the half. TSU added another Medina field goal in the third quarter to raise the score to 13-7, however the Delta Devils were not to be denied keeping the game close. The raddled off a touchdown, an extra point, and a safety to take the lead 16-13 to begin the fourth quarter. Texas Southern got the ball with 12:15 remaining in the game, with quarterback Jay Christope engineering a 13 play, 75 yard drive that results in the final touchdown of the game. The fleet-footed sophomore from Addis, Louisiana carried the final seven yards for the score to ensure the Tigers fifth victory of the season. Medina again did his job and added the extra point to secure the final core of 20-16. Christope completed 7-of-14 passes for 62 yards and one touchdown while Daveonn Porter carried the ball 22 times for 116 yards. 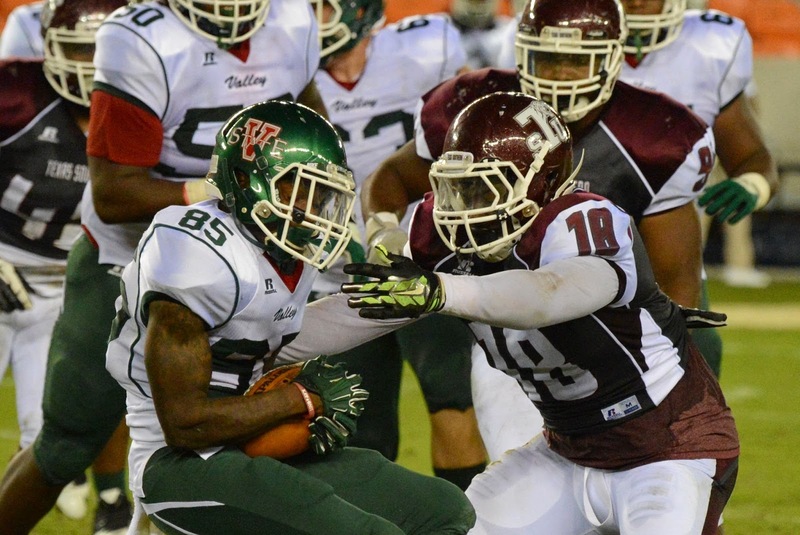 TSU will have a week off before they travel to Lorman, Mississippi to face Alcorn State on Saturday, October 18, 2014. HOUSTON, TEXAS (October 2, 2014) Kicking four field goals by Kyle Bullard was not enough for the University of Houston to overcome the UCF Knights, as the Cougars fall in their first conference game of 2014 by the score of 17-12 at TDECU Stadium in Houston on Thursday, October 2, 2014. All four field goals came at the end of sustained drives by the Cougars, but their inability to get the ball in the end zone for six points virtually locked the game up in favor of the Knights. Multi-position player Greg Ward, Jr., who saw action as quarterback, punt returner and wide receiver, came into the game in the second half and directed a comeback that nearly saw the Cougars pull out the win. Driving down the field with under two minutes left in the game, Ward made a last ditch attempt for a score. Rushing the last 19 yards towards the end zone, Ward was denied the touchdown as a result of a viscous hit by free safety Brandon Alexander, forcing a fumble into the end zone at the one-yard line. The Knights took possession of the ball with 24 seconds left in the game and killed the ball by taking a knee. The Cougars got on the scoreboard after recovering a UCF fumble, with an eight play, 27 yard drive with a 39-yard field goal by KyleBullard to take the score to 3-0 at the 9:50 mark in the first quarter. With the fumble recovery, Houston has taken the ball away from an opponent in 28 straight games. That is second nationally in the FBS. The Knights, capitalizing on a five-play, 25 yard drive, took the lead on a six-yard pass by quarterback Justin Holman to wide receiver Jackie Williams to put six point on the board. Shawn Moffitt split the uprights for the extra point to give UCF a 7-3 lead with 9:27 remaining in the half. A young Houston Cougars fan enjoys the game at TDECU Stadium. Houston cut the Knights’ lead to one, when Bullard connected from 42-yard out for his second field goal of the game. The Cougars’ scoring drive was 12 plays covering 56 yards and lasted 3:54. At the halftime break, the score remained 7-6 in favor of the Knights. UCF extended their lead by eight points when Holman found wide receiver Breshad Perriman open on the left side flat, sending the ball sailing for a 52 yard touchdown. Moffitt again secured the extra point to give the Knights a 14-6 lead. Houston began their possession and on a second and ten play, quarterback John O’Korn had a pass picked off by free safety Brandon Alexander, resulting in a four play drive that added three points to Knights’ total. Moffitt added the three points with a 42-yard field goal to increase UCF’s lead to 17-6. After the kickoff and resulting touchback, Greg Ward, Jr. was given the quarterback duties; quickly mounting a drive 40 yard drive that was hampered by penalties. Houston was forced to punt on a fourth-and-32 yard play, giving the ball back to UCF on their 30-yard line. Their drive stalled; forcing a punt which was caught by Ward, Jr. He stayed in the game as quarterback and promptly began another drive. Houston capped the 49 yard dive with a 51 yard field goal by Bullard to take the score to 17-9 in favor of UCF. Bullard’s third field goal of the game was the longest of his career. His previous best was 46-yards in 2013 against Louisville. He added a fourth field goal of 49-yards, with 4:46 remaining in the game to make the score 17-12. Both teams were plagued with penalties with Houston being flagged 11 times for 99 yards and UCF feeling the heat on 10 plays for 90 yards. Ward, who completed 10-of-17 passes for 116 yards, also rushed nine times for 40 yards. Running back Ryan Jackson carried the ball six times for 53 yards while Demarcus Ayers caught seven passes for 90 yards. Defensively, linebacker Efrem Oliphant accounted for 10 tackles, followed by Joey Mbu with eight and Gavin Stansbury and Adrian McDonald with seven each. With the loss, the Cougars have dropped their last four games against UCF. Houston will hit the road for an October 11 meeting against Memphis. Houston leads the series against the Tigers with a 13-9 record, downing them by the score of 25-15 last year in Houston. The Cougars are now 2-3 for the season and 0-1 in The American Conference.